Yes, Google Translate English-isiZulu does exist, but it has many errors (some very funny) and there’s a lot more to Natural Language Generation (NLG) than machine translation, such as natural language-based query interfaces that has some AI behind it, and they are needed, too . Why should one bother with isiZulu? Muendane has his lucid opinions about that , and in addition to that, it is the first language of about 23% of the population of South Africa (amounting to some 10 million people), about half can speak it, and it is a Bantu language, which is spoken by nearly 300 million people—what works for isiZulu grammar may well be transferrable to its related languages. Moreover, it being in a different language family than the more well-resourced languages, it can uncover some new problems to solve for NLG, and facilitate access to online information without the hurdle of having to learn English or French first, as is the case now in Sub-Saharan Africa. The three principal approaches for NLG are canned text, templates, and grammars. While I knew from previous efforts  that the template-based approach is very well doable but has its limitations, and knowing some basic isiZulu, I guessed it might not work with the template-based approach but appealing if it would (for a range of reasons), that no single template could be identified so far was the other end of the spectrum. Put differently: we had to make a start with something resembling the foundations of a grammar engine. Langa Khumalo, with the Linguistics program and director of the University Language Planning and Development Office at the University of KwaZulu-Natal, and I have been trying to come up with isiZulu NLG. We have patterns and algorithms for (‘simple’) universal and existential quantification, subsumption, negation (class disjointness), and conjunction; or: roughly OWL 2 EL and a restricted version of ALC. OWL 2 EL fist neatly with SNOMED CT, and therewith has the potential for interactive healthcare applications with the isiZulu healthcare terminologies that are being developed at UKZN. The first results on isiZulu NLG are described in [4,5], which was not an act of salami-slicing, but we had more results than that fitted in a single paper. The first paper  will appear in the proceedings ofthe 4th workshop on Controlled Natural language (CNL’14), and is about finding those patterns and, for the options available, an attempt at figuring out which one would be best. The second paper , which will appear in the 8th International Web Rule Symposium (RuleML’14) conference proceedings, is more about devising the algorithms to make it work and how to actually generate those sentences. Langa and I plan to attend both events, so you can ask us about the details either in Prague (18-20 Aug) or Galway (20-22 Aug) in person. In the meantime, the CRCs of the papers are online (here and here). 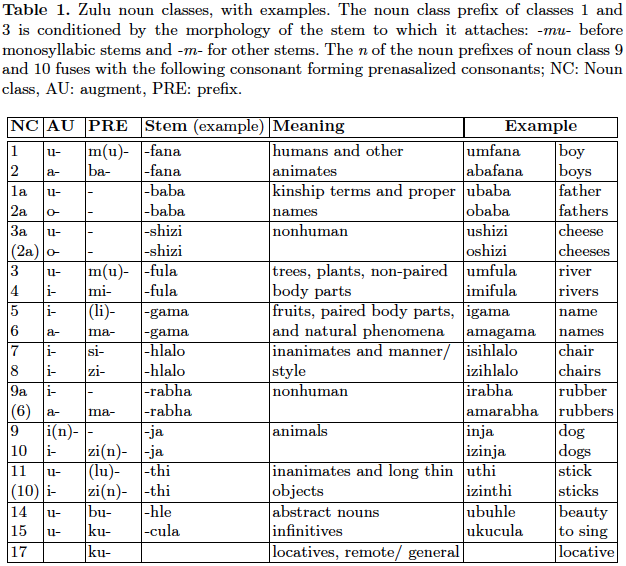 isiZulu noun classes with an example (source: ). What does this mean for the verbalization? In English, we use ‘Each…’ or ‘For all…’ for the universal quantifier and it doesn’t matter over which noun it is quantified. In isiZulu, it does. Each noun class has its own ‘each’ and ‘for all’, and it is not acceptable (understandable) to use one for the wrong noun class. For disjointness, like “Cup is not a Glass” ( in DL), in English we have the ‘is not a’ regardless what comes before or after the subsumption+negation, but in isiZulu, the copulative is omitted, the first noun (OWL class, if you will) brings in a so-called negative subject concord, the second noun brings in a pronominal, and they are glued together (e.g., Indebe akuyona Ingilazi, where the second word is composed of aku + yona), and to top it off, each noun class has its own concord and pronomial. A seemingly simple conjunction—just an ‘and’ in English—has to be divided into an and-when-it-is-used-in-an-enumeration and an and-when-it-is-a-connective, and when it is used in an enumeration, it depends on the first letter of the noun that comes after the ‘and’. Existential quantification is even more of a hassle. 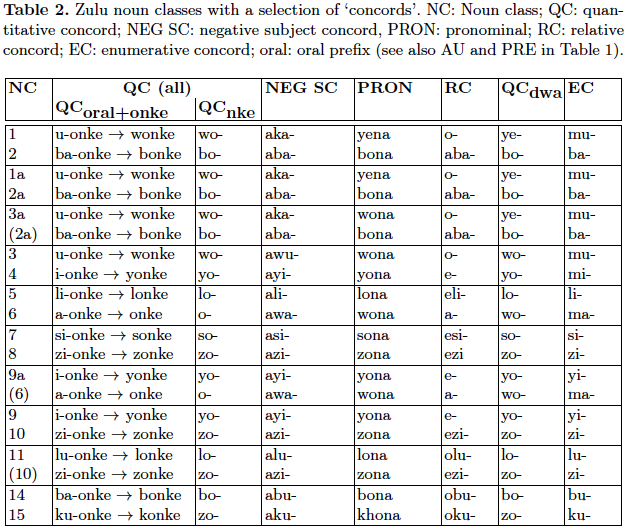 The table below shows a very brief summary comparing typical patterns in English with those for isiZulu. We did ask isiZulu speakers which of the possible options they preferred (in a survey, with Limesurvey localized to isiZulu), but there wasn’t an overwhelming consistent agreement among them except for one of the options for existential quantification (the –dwa option), although there was more agreement among the linguists than among the non-linguists, possibly due to dialect influences (results can be found in ). If you don’t feel like reading the two papers, but still would like to have some general overview and examples, you also can check out the slides of the CS colloquium I gave last week. I managed to ‘lure in’ also ICT4D people—and then smack them with a bit of logic and algorithms—but the other option, being talking about the other paper accepted at RuleML, probably would have had to be a ‘cookie colloquium’ to get anyone to attend (more about that paper in another post—it is fascinating, but possibly of less interest to a broader audience). If you want to skip the tedious bits and just get a feel of how one of the algorithms works out: check out the example starting on slide 63, which shows the steps to go from in FOL, or in DL (“Each professor teaches at least one course”, if the vocabulary were in English), to “Bonke oSolwazi bafundisa isifundo esisodwa”. Clearly, a lot remains to be done. Muendane, N.M. I am an African. 2006, Soultalk CC. Jarrar, M., Keet, C.M., Dongilli, P. Multilingual verbalization of ORM conceptual models and axiomatized ontologies. STARLab Technical Report, Vrije Universiteit Brussels, Belgium. February 2006. 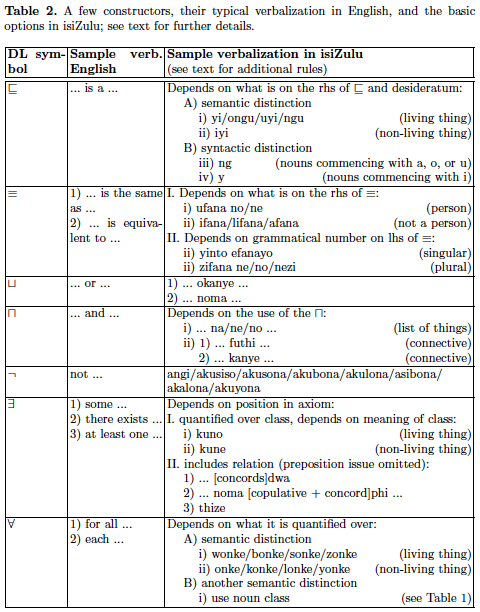 Keet, C.M., Khumalo, L. Basics for a grammar engine to verbalize logical theories in isiZulu. 8th International Web Rule Symposium (RuleML’14), August 18-20, 2014, Prague, Czech Republic. Springer LNCS (in press).